I pulled out my cool-weather clothing to greet this lovely September morn, selected an outfit, and learned that my body has…ahem…changed since I put these clothes away back in the Spring. Let’s just say that all those times I prayed that Prayer of Jabez – Lord, bless me indeed! Expand my territory! – I should have been waaaaay more specific. So instead of writing the funny, poignant Epilogue for my current book project (it would have been spectacular, I tell you) I spent this morning shopping for pants. Here is what I learned: Pants in my current size are not cute. They should never include the word “skinny” regardless of the current trend. The term “flattering” isn’t even in play here. What we’re shooting for is “not disastrous.” It’s just a couple yards of fabric, miles of stitches, and unfortunate pocket placement…and so much that can go wrong. I laid one pair on the floor of the dressing room and they were almost as wide as they were long. Not exactly the kind of look the kids are “Pin-ing” these days. Growing up, my sister & I used to tease our Dad about the his jeans–he’s tall, but has short legs, and his jeans were quite square. I thought of Dad today, and how of all of the scenarios I’ve imagined of what I’ll look like as I age, inheriting his figure is not one of them. I came home with my new square pants, choosing to believe their claim that they will draw the eye away from the entire lower half of my body. 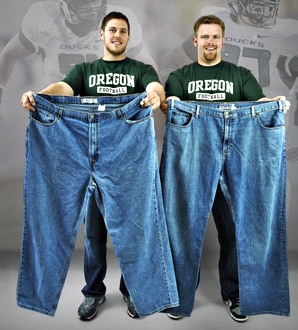 That’s asking a lot of pants, but why not believe? I guess I’m hoping that if I wear bright lipstick, I’ll just float apparition-like through the world with no one even noticing how sturdy I’ve become. I was exhausted by this, and annoyed with myself for letting it bother me so much. I mean, WHO CARES? My day was rescued by my friend Gretchen. She sent me a link to a craft project (I think it’s called a sampler?) where you cross stitch a whole bunch of chickens, complete with lyrics to a chicken song. I think she meant it as a joke. I laughed, then read the lyrics. 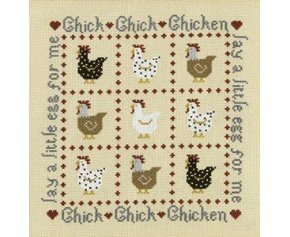 Then I ABSOLUTELY WANTED this poultry-themed cross stitch project, even though I’m afraid of birds and I’ve never stitched a cross. You see, the chicken song was one my mom used to sing to us when we were babies. It’s something about telling the chicken, Oh I haven’t had an egg since Easter, and now it’s half-past three! Nonsense lyrics. I can hear my mom singing this over and over to us, and to every baby cousin who has ever landed in her lap. It’s a great song. Gretchen found me the link to order it and everything. She was just so sweet. And I was reminded that life is both/and. It’s both square pants AND the chicken song. Both the realization that I’m chubby AND that I’m blessed with friends with a great sense of humor (and who claim to like me even upon learning that I’d want the chicken cross-stitch kit they thought was a joke). I opened Anne Lamott’s Help, Thanks, Wow, and realized today encompassed all three of these prayers. 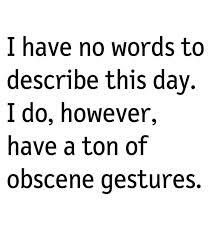 That’s a pretty good day. This entry was posted in Perspective on September 17, 2014 by Trish Ryan. This is great. Congratulations on your new chicken cross stitch. Looking forward to the new book project!